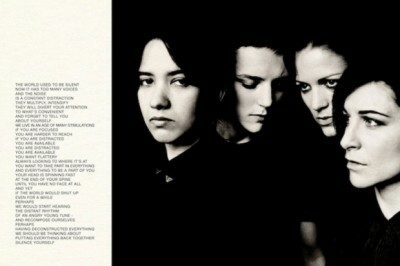 The hotly anticipated debut from Savages does not disappoint. Not one iota. ‘Sounds like a bloody racket!’ quipped one of my colleagues as the pre-release album stream thundered out of the computer speakers at work. Yes. It is a bloody racket. It’s dark, powerful, uncompromising music -and all the better for it. It’s menacing. Drenched in feedback. It does not care what you think. The promise that was hinted at on last year’s ‘Husbands’/’Flying To Berlin’ debut single is here in spades. This is an album to be played loud. This is an album that some won’t be able to handle. This is an album that follows in the footsteps of a heritage of bands like The Slits, The Raincoats, Throwing Muses and Sleater-Kinney, amongst others, whilst not necessarily sounding all that much like any of those bands. Bugger believing the hype. Savages are here in your face, and taking no prisoners. Silence Yourself is released on Pop Noire/Matador on May 6. Ahead of the album release, the album can be streamed over at the band’s website. I’ve been enjoying Savages’ rather fine debut single from last year ‘Flying To Berlin’/’Husbands’ for quite some time so it was rather a shock to discover that I hadn’t actually written about the band yet. So, I can take no credit for discovering them, and am probably not so much a bandwagon-jumper as a johnny-come-lately. I mean, they played their first gig as long ago as January 2012! …actually, that’s pretty recent when you think about it, isn’t it? 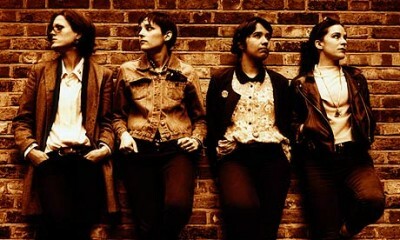 And The Guardian wrote about them last year that Jehnny Beth (vocals), Ayse Hassan (bass), Fay Milton (drums) and Gemma Thompson (guitar) might actually be the first guitar band in ages worth caring about. They evoke the best of post-punk scene of the last seventies and early eighties – but they sound fresh and vital. And when so much guitar music often just seems like a stake rehash, that’s a very good thing. Comparisons have been drawn with Siouxise and the Banshees and the Slits, neither of which I would disagree with, though to these ears the band they most remind me of is The Au Pairs. With a nod to the Raincoats. 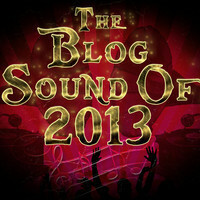 A few months back, I was asked to nominate my tips for bands and artists to make it big in 2013. ‘The Blog Sound poll was run by Robin Seamer from Breaking More Waves and Andy Von Pip from The Von Pip Express asking 49 UK music bloggers what emerging acts they were particularly excited about. The poll wasn’t intended to criticise the BBC’s Sound of list, but to simply represent the tastes of the voting bloggers. Of the five acts, Chvrches are the one I am most familiar with. I quite like Haim – I’ve always been upfront about my love of Fleetwood Mac, and the two tracks I have heard are pretty good. Savages produced a great single last year in ‘Husbands’ which reminds me of The Au Pairs, The Raincoats and The Slits (perhaps slightly less on the last one). Pins and the Neighbourhood I wasn’t aware of, so I can’t comment too much on them, as I would be doing so on the basis of one track apiece! They sound fine to me. It was great to be asked to take part again, and the best of luck to the acts concerned. A New Band A Day, A Pocket Full Of Seeds, All Noise, Alphabet Bands, Both Bars On, Brapscallions, Breaking More Waves, Brighton Music Blog, Details Of My Life So Far, Don’t Watch Me Dancing, Dots And Dashes, Drunken Werewolf, Eaten By Monsters, Electronic Rumors, Faded Glamour, Folly Of Youth, Flying With Anna, God Is In The TV, Harder Blogger Faster, Howl, In Love Not Limbo, Just Music That I Like, Killing Moon, Kowalskiy, Love Music : Love Life, Mudkiss, Music Broke My Bones, Music Fans Mic, Music Liberation, Music Like Dirt, My Bands Better Than Your Band, Not Many Experts, Peenko, Real Horrorshow, Scottish Fiction, Skeletory, Song By Toad, Sounds Good To Me Too, Storm’s Brewing, Sweeping The Nation, The Blue Walrus, The Electricity Club, The Mad Mackerel, The Metaphorical Boat, The Music Hoarder, The Recommender, This Must Be Pop, and Von Pip Musical Express.